Platform games have known a sort of resurgence in recent years also thanks to many Kickstarted games that have been released on consoles and PC. 3D platform games are also on the rise again, and a new one called A Hat in Time will be released in a few months on PC and MAC. In a new Kickstarter update, Gears for Breakfast confirmed that A Hat in Time will release this Fall on PC and MAC. We are happy to announce that A Hat in Time will release fall 2017. Ever since the Kickstarter launched we’ve been working really hard to bring the absolute cutest game on the planet – and I think we’ve achieved it. 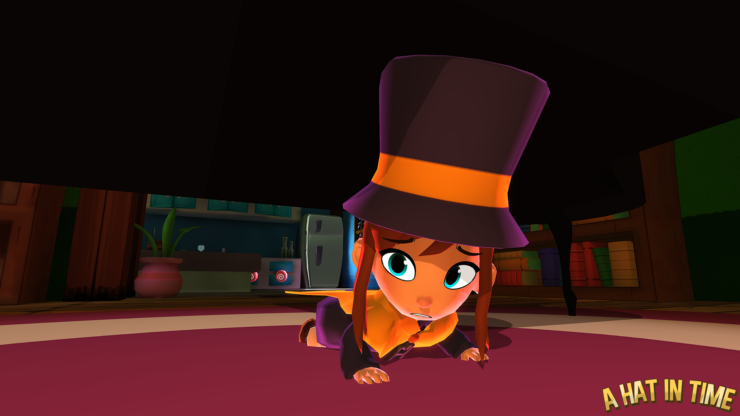 Hat Kid is heckin adorable. To celebrate the announcement, a new gameplay video has been released, showcasing a new act in Chapter 3. Murder on the Owl Express is an act in Chapter 3: Battle of the Birds, and it perfectly encapsulates our vision for A Hat in Time: A cute little girl in a messed up world, trying to jump, fight and stitch her way home. Someone is dead. Like… for real dead. Stabbed-in-the-back dead. In a cute 3D platformer. And it’s Hat Kid’s mission to solve this crime. Will she put on a cute detective outfit? Ofcourse. Is it up to her to decide who gets life in jail? Ofcourse. Do we enjoy putting Hat Kid in messed up situations? Absolutely. A Hat in Time promises to be more than just a simple platform game, as the team aims to tell the story of a little girl through the open free to explore environments featured in the game. With Yooka-Laylee opening up the doors for this type of game again, A Hat in Time will surely find its audience once it launches later this year. A Hat in Time launches on PC and MAC this Fall. You can follow the game’s Kickstarter page for all the latest news.